Quickly gaining a reputation as one of the area's most entertaining groups, Jumpin Jukebox have a repertoire that covers the greatest chart toppers & rare hits from the 50s, 60s, 70s, 80s, 90s & today. With a focus on, but by no means limited to the Rock 'N' Roll era, Jumpin Jukebox can cater to almost any crowd or occasion. We have a variety of formats available to suit any occasion. 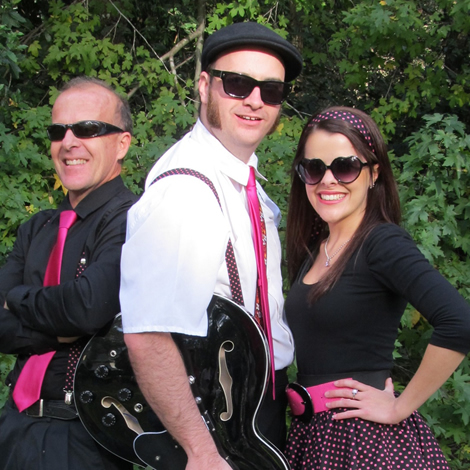 Rock N Roll Era: Dance hits form the 50's & 60's with the odd modern rock and roll song thrown in. Great for theme parties, festivals and car shows etc...Classic Party Hits: The best songs of all time, including audience requests. Great for pubs, clubs, weddings and parties. Our popular Tribute Shows, in full costume, have become a regular part of our shows, and are always a crowd favorite. Artists include Elvis Presley, Roy Orbison, Buddy Holly & Johnny O'Keefe! We have over 700 songs in our repertoire, and add new hits all the time. If we don't do it, we can learn it for your special occasion!